The holidays are an emotional time, filled with seasonal traditions and excitement, and can be filled with a fair share of stress. As part of the POPSUGAR Insights 2017 Holiday Report, we asked 3,000 US women to tell us if they feel holiday traditions are important to them and how they feel about the upcoming holiday season. Overall, 76% of moms feel that holiday traditions are very/somewhat important and 74% of millennial moms feel that holiday traditions are important. When the holidays come around, moms tend to feel excited or happy (58%), anxious or nervous (11%), sad or stressed (10%), loved (8%), optimistic (7%), and inspired (7%). Millennial moms are slightly more likely to feel excited or happy (61%) and two times less likely to feel sad or stressed about the upcoming holidays. When the holidays are over, moms tend to feel excited or happy (37%), sad or stressed (21%), loved (17%), optimistic (13%), and inspired (7%) with only 6% feeling anxious or nervous. 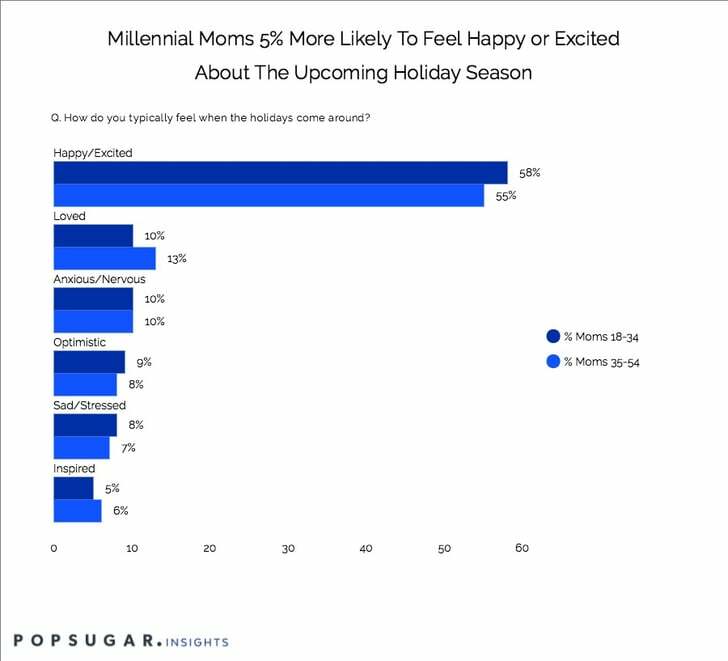 When the holiday are over, millennial moms tend to feel excited or happy (38%), sad or stressed (17%), loved (16%), optimistic (15%), inspired (10%), and anxious or nervous (5%). One of the ways moms can deal with the excitement or anxiety that accompanies the holiday season is to either exercise more or indulge more. Overall, 54% of moms admit that they "indulge a bit more" and 26% say they "work out less often" during the holidays, while only 9% say they "work out more often." By comparison, 57% of millennial moms admit that they "indulge a bit more" and 24% say they "work out less often" during the holidays, while only 9% say they "work out more often."